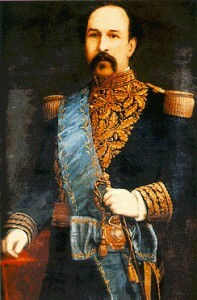 A year after the Assassination of Gabriel Garcia Moreno, Ignacio de Veintemilla assumed the presidency of Ecuador by coup. Initially, Veintemilla was determined to reverse the theocratic system of President Garcia Moreno with a firm, strong hand. Garcia Moreno had placed all education in Ecuador under strict Church control; Veintemilla reversed this and secularized education in February of 1877. The archbishop of Quito, José Checa y Barba, protested loudly against this declaring that he “would oppose with all his strength the propagation of error in his diocese.” But Veintimilla would have none of it; two weeks later the archbishop was poisoned on Good Friday – by means of strychnine added to the wine used for Mass (March 30th). Veintemilla even went so far as have a government order issued calling for a funeral service in memory of the soldiers who had fallen in the coup which had brought him to power (“victims of their devotion to liberty and their hatred of tyrants.”). The highly pro-Catholic Author P.A. Berthe recounts a subsequent series of events in which Vientimilla attempted to relentlessly subdue the pro-Catholic faction in Ecuador. …he solemnly received the Apostolic Nuncio, to whom he declared that his only anxiety was to preserve and even draw closer the links which bound the nation to the Holy See. As a proof of his sincerity he restored the Concordat and appointed his old enemy, [Bishop of]Riobamba, as archbishop of Quito. Ultimately Veintimilla was opposed by both “liberals” and “conservatives”. R. Perez Pimentel describes him as “well-built, well-loved and fun …made many friends”; however he appears to have cared little for religion. Ecuadorian opinion could not be persuaded to abandon the “Republica Catolica” for such a man. During the presidency of Veintimilla Dr. Martinez -recently returned from Pennsylvania with his newly-minted American Medical Degree- was establishing himself as a surgeon and member of the Medical Faculty at the new Medical School at Central University in Guayaquil. During this time he also married his first wife Rafaela Serrano y Ruiz and they started a family. Most of the drama of the back-and-forth contest between Veintimilla and the Church (such as the secularization of education and the revolt by the clergy and the populace that resulted, which directly affected Central University where he taught) took place in Quito so Dr. Martinez and his wife were undoubtedly close witnesses to it; but he was busy with his medical profession at this time. Toward the close of Veintimilla’s presidency, Eloy Alfaro was leading military campaigns and at one point he proclaimed himself “Jefe Supremo” of Manabi and Esmeraldas provinces (northwest province). 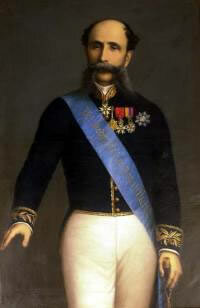 In the end Alfaro was powerful enough to besiege Guayaquil and force Veintimilla from the presidency but Alfaro’s movement was not powerful enough to seize the presidency (ie: to install Alfaro himself as the new president) at this time. When Jose Maria Caamaño assumed the presidency he was viewed by the pro-Catholic faction as their candidate of choice for permanently re-imposing a “Republica Catolica” on all of Ecuador. Many years before, President Garcia Moreno had named him as the right man to succeed him as he had “…all the essential qualities of a statesman one whose honour was without a stain, with good sense and a strong religious spirit, being among the number of those who at Guayaquil had never hesitated to practice his duties as a Christian…”2. Acclaimed as “Conservative and Catholic, devoted to the Church…”, he is reported to have gone so far as to request from Garcia Moreno’s widow the scarf of her late husband so that he could wear it while taking his oath of office. Then, in June of 1886 he presided over an opulent religious ceremony (“Eucharistic Congress”) in Quito to mark the thirteen-year anniversary of the dedication of the Republic of Ecuador to “The Sacred Heart of Jesus” which had originally occurred under Garcia Moreno in 1873. Apart from the details of the ceremony itself, this dedication was intensely symbolic of a complete re-immersion and re-imposition of the theocratic “Republica Catolica” system in Ecuador. Author Peter Henderson provides an excellent explanation of its symbolism in relation to Garcia Moreno. Now President Caamaño was fully intending to send the same message that his slain predecessor had sent thirteen years before. But it wouldn’t be sufficient to simply re-enact the dedication of Ecuador; no, the young son and the widow of the slain Garcia Moreno who had first instituted the “Republica Catolica” were given a central role in the ceremony. The whole city of Quito was “hung with black” and funeral orations were read for the great departed hero Gabriel Garcia Moreno. The ceremony included a “Litany of Reparation” in which the “Pardon! Pardon!” of God was implored for “the shameful excesses of the Press”, “attacks against ecclesiastical authority”, “impieties and blasphemies” …etc…etc. The message was clear! A lengthy description of the whole ceremony appeared in a book published in 1889. Click the “expand” link below to read this lengthy description. “The Honourable Jose Maria Caamano, one of the leading men of the Conservative party, had been elected President a year before the tenth anniversary of the terrible drama at Quito [ie: the murder of Garcia Moreno], and he determined on a solemn glorification of the Christian hero whom the miserable tyrants of the preceeding years had so wontonly insulted. Then followed the Litany of Reparation, the responses being said by the whole people. ” Pardon us, good Lord ! pardon us!” cried the whole immense multitude as with one voice. It was in the early period of Caamaño’s Presidency – in late 1885 – that Dr. Martinez first started to speak out publicly in his weekly publication El Perico (“The Parakeet”). In this publication, Caamaño is not mentioned – nor is any identifiable individual singled out for criticism. Instead the authors are birds or pseudonyms; and concepts rather than individuals are attacked. In some cases metaphorical individuals are created in the text and these are attacked. The first issue of El Perico was published on November 7th 1885. By early February, a mere three months later, the government had shut down publication. Under threat of imprisonment3, Dr. Martinez was allowed to go into exile to Peru. At that time he was married to his first wife Rafaela Serrano y Ruiz and the couple had several small children. He was a highly respected physician and a University Professor at the Medical School of Central University in Quito; Ecuador’s largest university and one of the oldest in the Americas. He undoubtedly had no way of knowing how long his exile would be. In fact it would last three years until Caamaño’s successor came to power, President Antonio Flores Jijón. President Caamaño’s term of office ended in 1888 at which time he exited the Presidency, passing power peacefully to his duly elected successor. By the mid 1890’s he was governor of the province of Guayas. But in 1895 he became involved in a complex transaction that would have grave consequences for himself and for the country. The government of Chile wanted to sell (ie for profit) a battleship to the government of Japan but they could not legally do so due to the fact that they had officially declared themselves to be neutral in the Sino-Japanese War. Due to the fact that Caamaño had close ties to Chile and to Ecuador’s Chilean Ambassador, he became aware of this intention of the Chilean government and agreed to act as an intermediary in the transaction to make it appear as if Ecuador had bought the ship from Chile and then sold it to Japan. But ultimately the scheme was uncovered; it became known as the “Esmeralda Affair” or “Sale of the Flag” (“venta de la bandera”). Cordero, the president in 1895, claimed ignorance of the whole affair and Caamaño openly confessed his complicity but ultimately the Ecuadorian courts upheld the illegality of the matter, the opposition was strong; the president resigned and Caamaño departed Ecuador forever. His circumstances left him impoverished and he lived out the remainder of his life in Seville Spain and died there in poverty on December 31st of 1901 (or 1900 according to another account) – a mere five years after his departure. President Antonio Flores was the son of General Juan Jose Flores who had served as President of the Republic of Ecuador at its inception in the 1830’s. Biographer Rodolpho Perez Pimentel mentions that in 1877 when president Veintimilla was attempting to undo the programs of Garcia Moreno, Antonio Flores’ home had been raided and “he was imprisoned by order of President Veintimilla due to ‘links with conservative elements’ ” …but that after a few days he managed to escape and that by January 1878 he was living in New York with his daughters. Antonio Flores Jijon is also noted for having formed the somewhat short-lived “Progressive” party in Ecuador and he was the first president allied with that party. The Progressive Party (originally known as the “Republican Union”) was a response from the pro-Catholic or conservative side intended to break the old conservative/liberal stalemate and reconcile the interests of the coastal constituency (centered in Guayaquil) with the mountain constituency (centered in Quito) in a new alliance. But it was not destined to last. The great revolution of Alfaro three years after Flores’ presidency ended would bring profound changes to the political landscape of Ecuador. This entry was posted in Presidents. Bookmark the permalink.